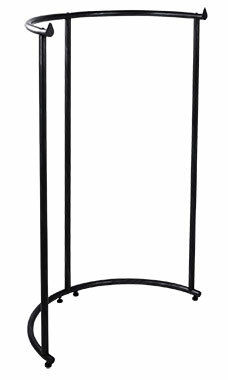 Our Half Round Clothing Rack - Black is sure to add a touch of style to your showroom floor. The Black Half Round Rack features 64" of hanging space in a unique space saving design. Measuring 44"W from side to side with a 1¼” diameter hangrail the the Black Half Round Rack is adjustable in height in 3" increments with its lowest setting being 52" and a maximum height setting of 72" you can show off a variety of merchandise with one rack.